MilanoCinema and Kodak are holding their second Italian Super 8 Film Festival, with non-stop screenings October 24th and 25th. The event is going to feature a vintage and a current super 8 film lineup. My film, There May Be Pleasure is playing in the competition program on the 25th. The folks over at the Cambridge Int. Super 8 Film Fest have been asked to put together a night of films that are “love themed” for Valentine’s Day. My film, There May Be Pleasure was one of the selections. Its going to be at the Picturehouse in Cambridge, UK and the event is free. So head on down with your loved one and get ready for a romantic evening. The Internet Movie Database (IMDb) is hosting There May Be Pleasure’s trailer as part of a pilot for their new IMDb Theaters initiative. You’ve been invited to showcase your work on IMDb Theaters. Read on to see how you can be among the first to join this exciting new program. IMDb Theaters is a major new initiative from IMDb (The Internet Movie Database) and Withoutabox to create a global, online showcase for top short films. More than 50 million passionate movie lovers visit IMDb each month, making it the world’s most popular movie site and one of the largest sites on the internet. Now, for the first time, consumers are be able to watch high quality, streaming video, right on IMDb Title Pages. FOR IMMEDIATE RELEASE: Phoenix, AZ. Local filmmaker Steven Christopher Wallace entered into a distribution agreement for his film There May Be Pleasure with Ouat! Media, a short film distributor based in Toronto, Canada. The agreement covers all media and territories. Today a group of friends and I went to the 9th annual Back Alley Film Festival in Tucson for the US premier of There May Be Pleasure. Aside from me it was, Clint, Ragen, Eric, Tara, Jaime and Sherman. Clint, Ragen and I stayed at the Hotel Arizona on the 6th floor. It was a pretty cool 60s/70s ish building that kind of made me feel like I was in the Conversation with Gene Hackman. The rest of the Gang stayed at the historic Hotel Congress. The Back Alley Film Festival takes place in an alleyway behind Bisonwitches on the University of Arizona campus. 20 films were selected to play at this outdoor event, from Germany, Canada, Spain, Scotland, Ireland, and the US. Before watching the screenings we all got sandwiches and drinks. After the screening we returned to Hotel Congress. We had some drinks in the lobby. Inside the hotel, there is also a club. Sherman, Jaime and I went the their dance night, BANG! BANG! Everyone else called it a night. We closed it down dancing and drinking. Afterwards we returned to our respective hotels. The next day we went to Yoshimatsu. This is my favorite Japanese Restaurant in Tucson. I got an authentic udon bowl and some sides. As usual it was outstanding. It was a great trip, and I am so happy that so many of my friends were able to join me and I am grateful their support. Arrived in London about seven hours ago. The flight went well. They gave me a free Johnny Walker Red, and a red wine with dinner. So that was pretty good. Also, they showed the Gondry movie, ‘Science of Sleep’, which I liked a lot. 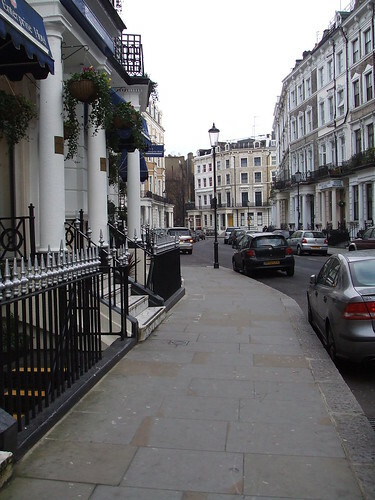 I’m staying at the Shaftsbury Kensington, its in central/west London in a pretty posh nieghborhood. My room is probably 100 sq. ft, but I have a 42″ plasma TV, and when I asked reception for a video cable to hook up my laptop they gave me a THX monster brand cable! There May Be Pleasure is the story of two college students, Nathan and Keren. While working on a project together for film class, Nathan realizes he is more interested in Keren, than his studies. The story unfolds through a series of sequences Nathan is filming for the project. In each progressive shot, we follow Nathan’s internal dialog as it reveals more of how he feels about Keren. The filming of There May Be Pleasure utilized many different techniques for its visual effects. The image was filmed directly off the projector screen, footage was also scanned, manipulated and filmed off an lcd, net filtration was used to differentiate imagination from reality and the film was shot chronologically utilizing all ‘first takes’, for a completely in camera edit. Read the production journal for There May Be Pleasure on page 16 and 17 of the 03/2008 issue of SmallFormat magazine. The journal was published as part of the “My Film Diary” promotional campaign sponsored by Kodak. Tempest Fugit was an attempt to isolate narrative outside the of realm of time. 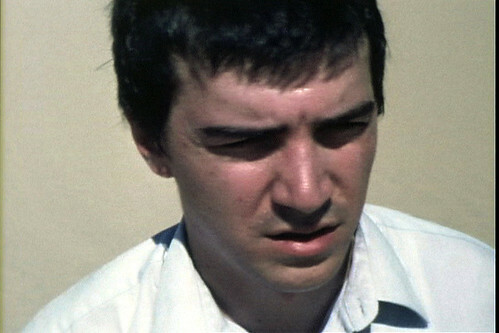 Consciousness and the unconscious were secondary themes with the film. Shooting took place on location in Tempe, Arizona and in the Imperial Sand Dunes Between Yuma, Arizona and el Centro, California. The project started out, as an answer to the question, ‘Can you make a film about time’. Honestly, I believe that time is an abstraction, constructed by the mind. Furthermore, I would suggest that the mind cannot piece together a cohesive story-element without the use of both time and narrative devices. So to ask, ‘can one make a film about time?’, my response would be; ‘not without introducing narrative elements’. The story is about a man sleeping. In his dream, he knows only that he must return to his body, before he wakes. He finds himself lost in a vast endless desert. He awakens for a drink. After making his way home, he finds himself sleeping in vaguely unfamiliar surroundings. Then his alarm clock wakes him. Finally, we cut back to him climbing one last dune.